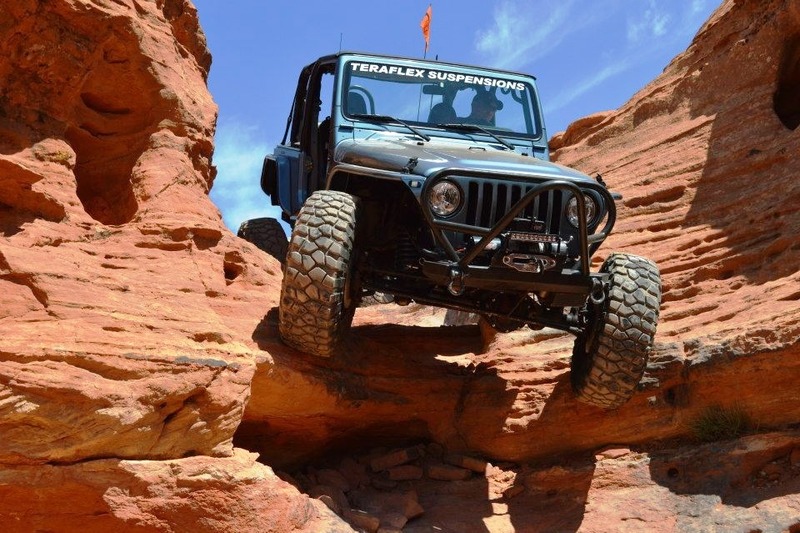 Zack taking his Jeep on one of the most challenging and scenic trails in St. George – The MAZE Trail. Most of us see rocks piles, mountain foothills and trails as roadblocks. 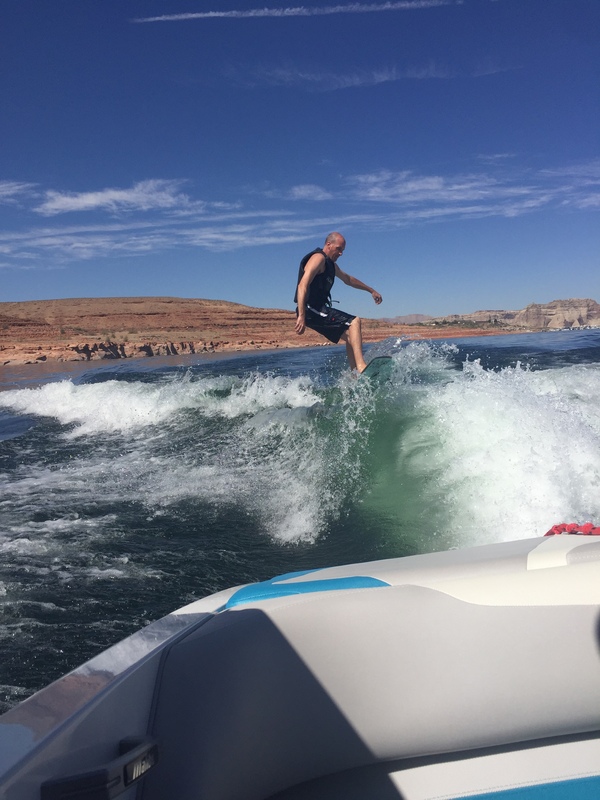 TDS employee Zachary Abbott, network specialist – Network Operations in St. George, sees an adventure to drive right over them. Zack is an extreme rock crawler. He uses a Jeep and goes off-road to climb steep rocks and mountain cliffs. “I’ve always been into Jeeps and playing in the sand and rocks,” he said. Zack was introduced to the rock crawling when he, his brother-in-law and dad started going to Moab, Utah for the sport of rock crawling. For more than 20 years, Moab has been the place to watch the sport’s legends attempt the impossible. The week-long celebration each spring attracts more than 12,000 spectators and 5,000 4x4s. Zack’s second Jeep on The Rubicon Trail, west of Lake Tahoe, Calif.
Moab is all about spectacular Utah scenery, said Zack. It also has challenging trails. Zack has gone rock crawling at The Rubicon Trail, west of Lake Tahoe, Calif. (see photo to the right). Locally, he tackles the rocks at Sand Hollow State Park near Hurricane, Utah and The MAZE trail in St. George, which runs along a thousand-foot red rock cliff and provides spectacular views (see first photo). 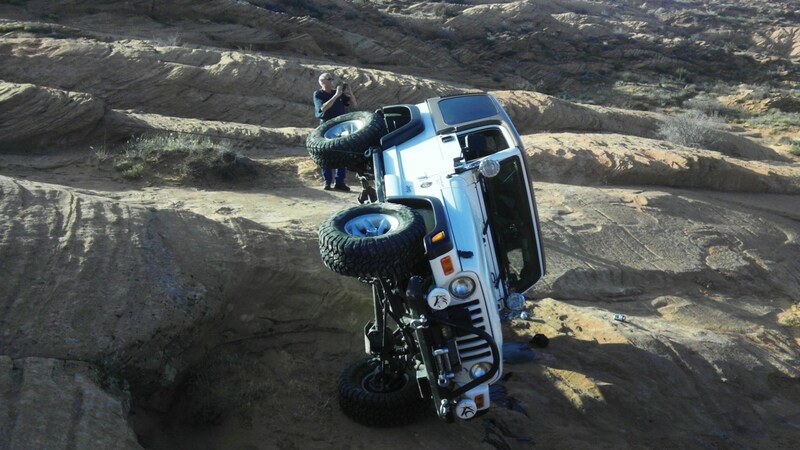 An unfortunate day in St. George for Zack’s dad and his rolled over Jeep. Fortunately, no one was injured. He’s been fortunate to never tip over his Jeep, but his brother-in-law and dad have tipped a few times (see photo to the left). When you tip, he said, you’ve basically ruined your Jeep. “You’ll need a tow off the trail,” he said. But Zack said his favorite part of rock crawling is socializing and meeting people. As the driver works to get through the obstacles, others watch and learn from them. Rock crawling, he adds, takes patience, slow speeds, skill and some nailing biting. “It’s really an adrenalin rush,” he said. Have you ever been rock crawling in a Jeep? If yes, where did you go?